Deafmoolah Financial and Career Fair 2013 will be a unique event for People with Disabilities (PWDs/OKU) to meet and associate with business communities/public - sharing of ideas around the theme "Bringing OKU and Business Community Together". 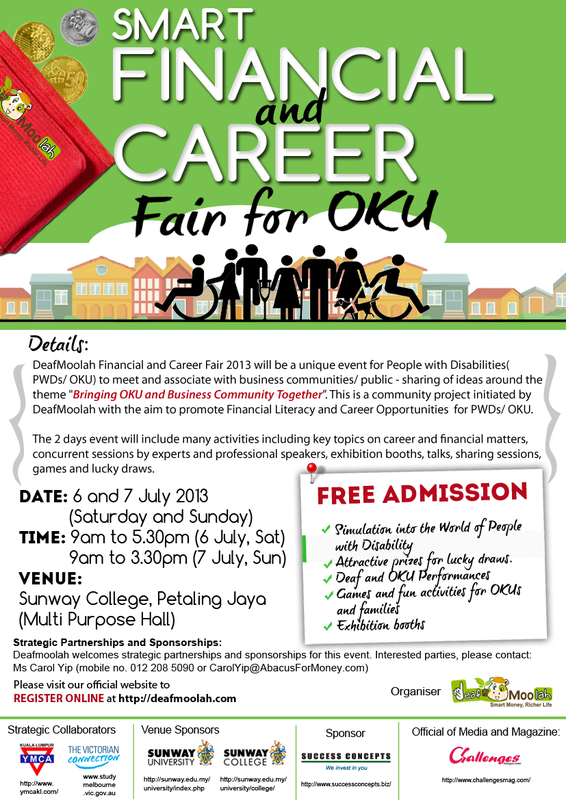 This is a community project initiated by Deafmoolah with the aim to promote Financial Literacy and Career Opportunities for PWDs/OKU. The 2 days event will include many activities including key topics on career and financial matters, concurrent sessions by experts and professional speakers, exhibition booths, talks, sharing sessions, games and lucky draws. deaf from the OKU and Business communities to share and discuss ideas around the theme ‘Bringing the OKU and Business Community Together’. with more dignity and bring them together to build the social and business communities together.